Project plans are essential to keeping all things project-related organized and on track. A great project plan will help you kick off your work with all the necessary pieces—from goals and budgets to milestones and communication plans—in one place. Save yourself time (and a few headaches) by creating a plan that will make your project a success. Here’s how. Why are project plans important? Project plans set the stage for the entire project. Without one, you’re missing the first critical step in the overall project management process. A clear, written plan for a project provides direction to all stakeholders, while also keeping everyone accountable. It confirms that you have the resources you need for the project before it actually begins. A project plan also allows you, as the person in charge of leading execution, to forecast any potential challenges you could run into while the project is still in the planning stages. According to a study conducted by the Project Management Institute, there is a strong correlation between project planning and project success—the better your plan, the better your outcome. So, conquering the planning phase also makes for better project efficiency and results. You’re working on this project for a reason—likely to get you, your team, or your company to an end goal. But how will you know if you’ve reached that goal if you have no way of measuring success? Identifying a desired outcome is important. Doing so gives a rationale for your project, while keeping everyone on the same page and focusing on the results they want to achieve. Make sure your goals are measurable. For example, a goal for an event might be to host an annual 3-day conference for SEO professionals on June 22nd with at least 1,000 attendees. It’s both clear and measurable. You’ll also want to include Key Performance Indicators (KPIs) in your project plan which will allow you to measure your performance against the goals you’ve set. While your goal serves as the intended result, the KPIs let you know whether or not you’re performing on track to achieve that result. A KPI for our event example is the number of new email list subscribers to promote the SEO conference. You’re not likely going at it alone (but if you are, this detail will still be beneficial). Running a project usually means getting collaborators involved in the execution of it. In your plan, outline which team members will be a part of the project and what each person’s role will be. This will help you decide who is responsible for each task (something we’ll get to shortly) and let stakeholders know how you expect them to be involved. Using a system, such as the DACI model, will help determine who is driving the project forward, who will approve decisions, who will contribute to the project, and who needs to remain informed as the project progresses. Running a project usually costs money. Whether it’s hiring freelancers for content writing or a catering company for an event, you’ll probably be spending some cash. Establish your budget before the spending begins, so you can get approval and, once approved, make smart, economical decisions during the implementation phase of your project. Allocating that budget appropriately will also be easier since you’ll already have a project plan established. Planning helps you determine what parts of your project will cost what—leaving no room for surprises later on. An important part of planning your project is setting milestones, or specific objectives that represent an achievement. Milestones don’t require a start and end date, but hitting one marks a significant accomplishment during your project. They are used to measure progress. For example, let’s say you’re working to develop a new product for your company. Setting a milestone on your project timeline for when the prototype is finalized will help you measure the progress you’ve made so far. A deliverable, on the other hand, is what is actually produced once you meet a milestone. In our product development example, we hit a milestone when we produced the deliverable, which was the prototype. Now that you’ve covered the high-level responsibilities, it’s time to focus some energy on the details. Start by breaking your project into tasks, ensuring no part of the process is skipped. Bigger tasks can even be broken down into smaller subtasks, making them more manageable. Then, take each task and subtask, and assign it a start date and end date. You’ll begin to visually see everything come together in a cohesive project timeline. Be sure to add stakeholders, mapping out who is doing what by when. We’ve established that most projects include multiple stakeholders. That means communication styles will vary among them. You have an opportunity to set your expectations up front for this particular project. Having a communication plan is essential for making sure everyone understands what’s happening, how the project is progressing, and what’s going on next. And in case a roadblock comes up, you’ll already have a clear communication system in place. How many project-related meetings do you need to have? What are their goals? How will you manage status updates? Where will you share them? What tool will you use to manage the project and communicate progress and updates? Next, to help you understand what your project management plan should look like, here are two example plans for marketing and design projects that will guide you during your own project planning. You establish that your goal for creating and executing against your content calendar is to increase engagement by 10%. Your Key Performance Indicators (KPIs) are the open rate and click through rate on emails, your company’s social media followers, and how your pieces of content rank on search engines. There will be five people involved in this project. Your budget for the content calendar and a year’s worth of content is $50,000. 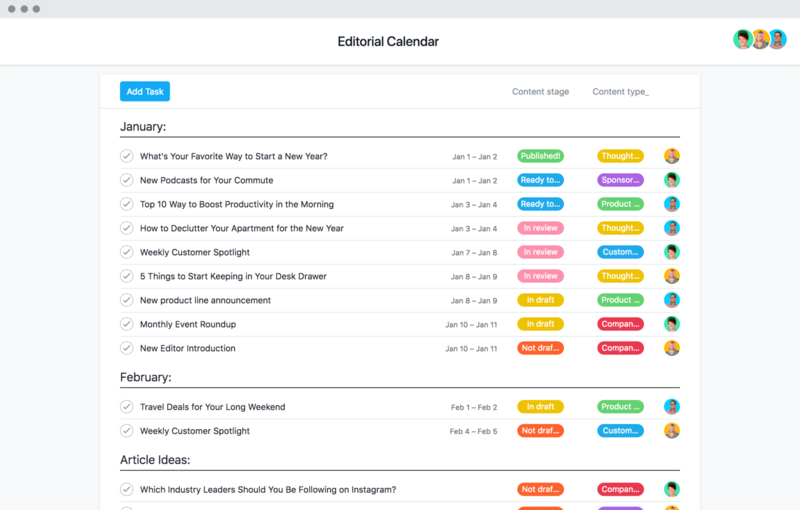 Your first milestone is to finish the content calendar, which shows all topics for the year. The deliverable is a sharable version of the the calendar. January 16 - December 31: Paula will begin publishing and continue to do so on a rolling basis throughout the year. You’ll have a kick-off meeting and then monthly update meetings as part of your communication plan. Weekly status updates will be sent on Friday afternoons. All project-related communication will occur within a project management tool. In this example, your website is finally being updated with a website redesign. (Actually, it’s more like a total overhaul.) This project will require a detailed plan, given its large scope and high expectations from various stakeholders. Your overall goal is to increase conversions on the company’s website 15% by the end of the year. Your KPIs will be the number of daily visitors who sign up for your free trial and the signup conversion rate. The budget for the new website redesign is $30,000. You’ll reach your first milestone when the research phase is complete and Sophie sends a report with recommendations on how to move forward with design and content (the deliverable). March - May: Sophie will conduct all necessary research for the website redesign. May - July: James and Shelly will be simultaneously creating the design and content. Early August: Kate will launch the new website, with James’s designs and Shelly’s content. As for the communication plan, a project management tool will be used to keep all tasks, communications, and assets in one place, making them easy to find for all stakeholders. A kick-off meeting will be held before any work begins, and meetings will occur at the end of each milestone. All other communication, including status updates and incoming work requests, will happen in the project management tool as well. Congratulations—you’re officially a project planning pro. With a few steps, a little bit of time, and a whole lot of organization, you’ve successfully written a project plan. Moving forward you’ll be able to keep yourself and your team on track, and address challenges early. 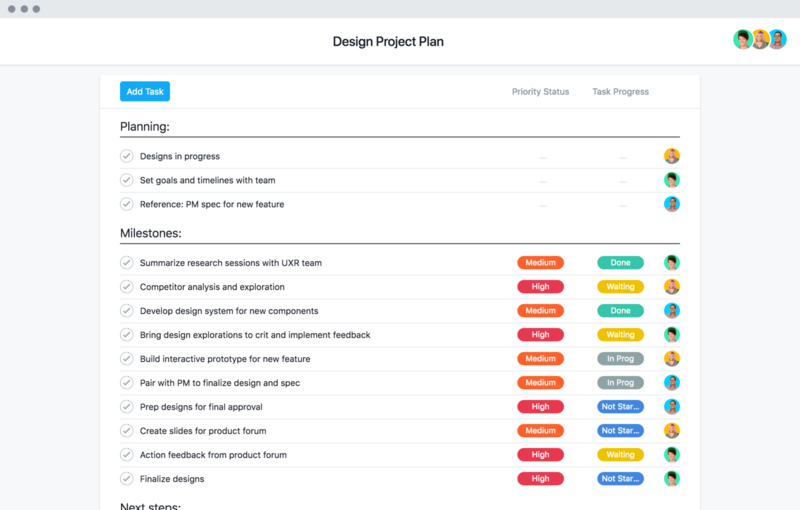 And by using a project management tool like Asana, you can work through each of the step of your project plan with confidence. 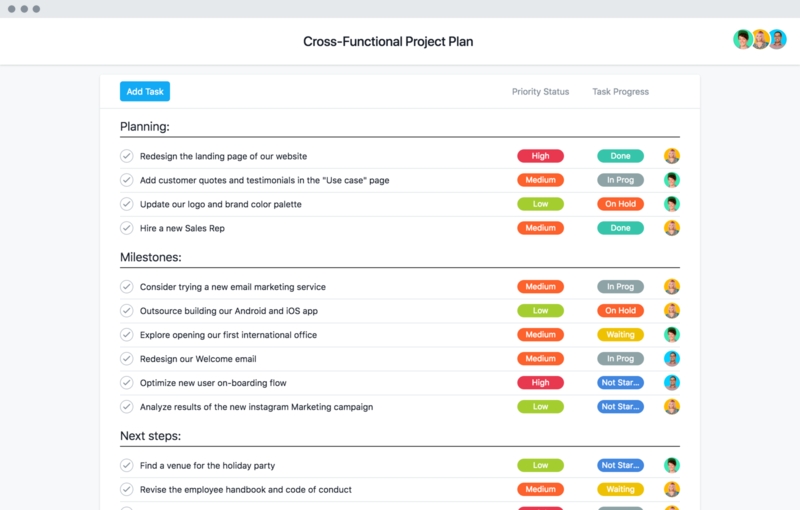 Create your next project plan with Asana.